The expander wheels FAPI-VU are an ideal grinding tool for work with every kind of abrasive sleeve. The expander wheels are supplied only with a special grooved coating of foamed up Vulkollan® , whereby the abrasive sleeve is tensioned during operation by the centrifugal force. The expander wheels with a coating of foamed up Vulkollan® are in practice often simply called “foam expander wheels” or abrasive sleeve holders. Because of these outstanding properties, the expander wheels FAPI-VU have proven themselves in the market over decades. The coating of foamed up Vulkollan® is only available in one level. The foamed up Vulkollan® has a coating hardness of 45° Shore (A). A softer or harder coating would result in individual “ribs” expanding too little or too much during operation as a result of the exerted centrifugal force to tension the abrasive sleeve correctly. 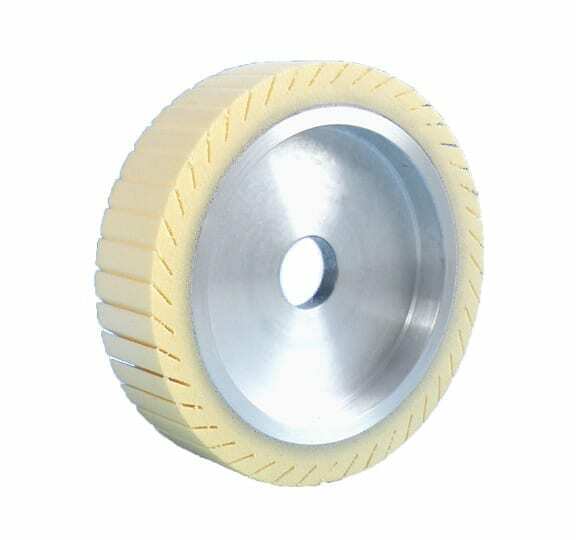 On customer’s request, we will also produce expander wheels FAPI-VU in other hardness. Important: The right expander wheel hardness always depends on the individual application. In addition to the sale of new expander wheels, as a service, we also recover used expander wheels insofar as we can determine that this is possible. This provides our customers with a cost-effective alternative to the purchase of a new expander wheel.